Was Burger King wrong to 'trick' influencers into promoting its food? YouTube star Casey Neistat is beefing with the chain. YouTube star Casey Neistat is calling Burger King out for "tricking" social media influencers into promoting its Funnel Cake Fries. Last week, Burger King started liking people's tweets from 2009 and 2010. The chain liked old tweets from Neistat, along with celebs such as Jimmy Fallon, Chrissy Teigen, Justin Bieber, and Ariana Grande. Complex reported that this is a marketing stunt for its Funnel Cake Fries relaunch. The product was introduced to Burger King restaurants in 2009, but returned last week. "Why is Burger King liking my 8-year-old tweets?" tweeted a baffled Neistat last week. But on Tuesday, once he had figured out what Burger King was up to, he posted a tongue-in-cheek YouTube video to the chain in response. "Social media people like me -- influencers, terrible word -- but we leverage social media to make money," Neistat said in the video. "We are not brain surgeons or rocket scientists. We are people of average intelligence, and because of that it is not nice to manipulate us into hawking your sugar coated French fries." He then likened influencers to "little mice who went for the cheese in the trap and it snapped on us." 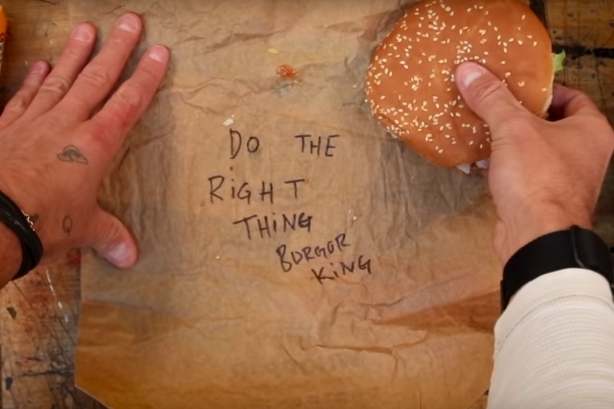 Neistat did pat Burger King’s marketing team on the back for a job well done numerous times in the video. However, he ended it by telling the chain to "give him something in exchange to level out the balance in the social media universe," suggesting Burger King donate to nonprofits that help underprivileged kids. Burger King quickly responded on Tuesday afternoon with a tweet that said, "Sup @CaseyNeistat, we’re ready to meet your ‘suggestions.’ Slide into our DMs real quick." Burger King representatives were not immediately available for comment. Was Burger King wrong to "trick unsuspecting, innocent social media influencers" into promoting its food, as claimed by YouTube star Casey Neistat?